Ok, I admit that I said a few weeks ago that I wouldn’t let anything distract me from Khorne until all the Berserkers were done, but I slipped. After painting Kharn I found myself overexcited about the idea of painting things red (the inner Ork rising to the surface perhaps) and flailed around eagerly until my hand fell on this chap. 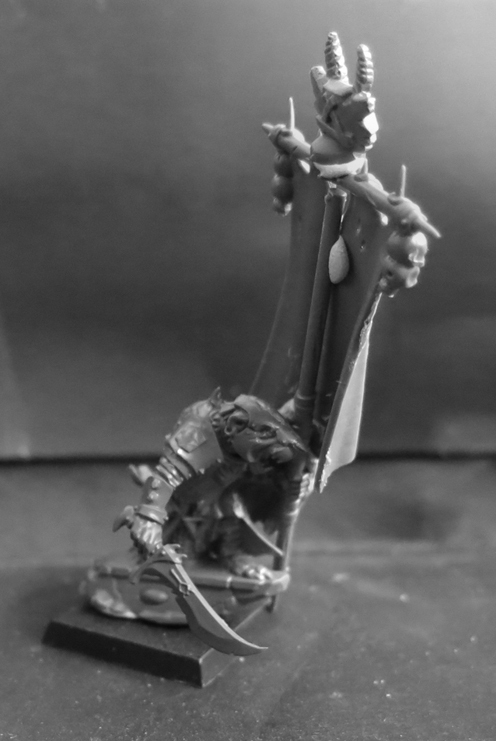 The priest, although sharing a distinct similarity to Games Workshop’s Empire warrior priests, comes from MOMminiaturas, a Spanish miniatures company who combine low-low prices with excellent quality models and are well worth checking out. One minor issue is that the website is almost entirely in Spanish, which makes the ordering process a little difficult for those of us who don’t speak the language. Then again most people in the world have the same issue with websites in English and they make do without too much complaint so I’d recommend manning up and applying a combination of common sense and the (debateable) charms of google-translate to get you where you need to be. Or better yet, make friends with an actual Spanish person – making repeat orders considerably easier and providing you with a boon companion and all the joy that results from having another human being to share life’s journey with. As usual comments and feedback are welcome. June 1977: a legend is born… I know what you’re thinking but it wasn’t me, I was still seven years away. No the hero of which I speak is the White Dwarf, the magazine which for many of us provided our first peak into the world of fantasy miniatures. Back then Games Workshop was a very different beast to the one that stands astride the gaming world today and the pages of the magazine ranged far beyond the contents of their own stable. That first issue opened with the line “Over the past two years the state of the art of wargaming has seen dramatic change”. What they described was the birth of Dungeons and Dragons and the emergence of fantasy and science fiction into the world of gaming. Before that, the editorial asserted, there was nothing but historical miniatures, “only tanks, French Hussars and Ancient Britons” as far as the eye could see. Then suddenly, a revolution, a Big Bang, a singularity from which erupted all the orcs and aliens we know today. It’s quite a claim, and certainly one that puts the dawning of the Age of Sigmar into context doesn’t it? The really interesting editorial however, when thinking about the recent history of the magazine, came with Issue 3. Describing the success of the first two issues they note “This does not, however, mean that the editorial staff of White Dwarf can become complacent and let the magazine drift into a safe, stereotyped format. 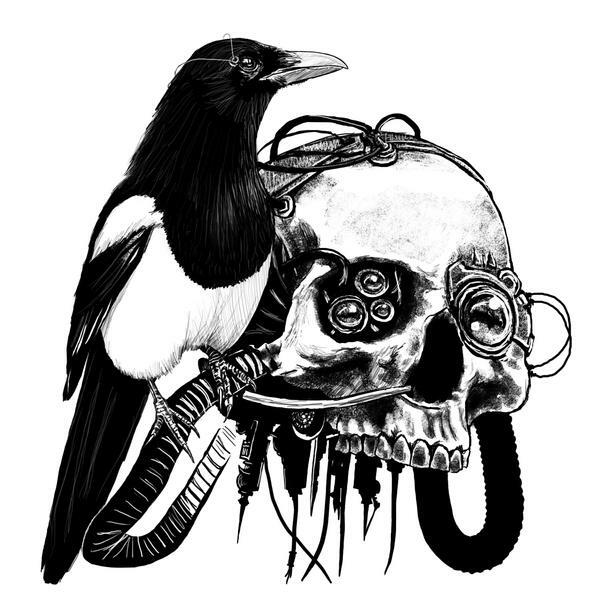 We want to keep it alive and bubbling with new ideas and interesting articles. We put into its pages that which we find of interest”. Sadly, many would argue that in recent years this promise has failed to be fulfilled. I joined the readership of White Dwarf much later of course, with Issue 351 in March 2009. Unlike (I’d suggest) the majority of people, I’d been painting miniatures for a long time already, and even had several years of collecting Games Workshop’s models under my belt before I finally picked up their magazine. Old hands would argue that by then the rot had firmly set in by then, but just as everyone remembers the James Bond of their childhood as the best one* so everyone hails their first White Dwarf as a classic from a golden era of miniatures journalism. All I can say is that Issue 351 ticked a lot of boxes for me; conversion articles on Warhammer heroes and the (then newly released) Stompa, a showcase of several enormous armies, an Ork painting tutorial and a well-rounded article on all things Lizardmen. Best of all there was an enormous battle report in which a ridiculously sized Ork army commanded by six different players took on an equally vast Imperial host across four different gaming tables simultaneously. *Again, not strictly true in my case – Brosnan never cut it for me. After that I bought it fairly often, although I didn’t subscribe until October 2012 when the magazine entered its next incarnation. Straightaway it was clear that this was a classier beast, bigger and thicker than its predecessor, packed with beautiful images and genuinely interesting and readable articles. We had designers’ notes on the new Chaos Marines, painting tutorials, showcases covering painting, converting and terrain, a look back at the development of the Horus Heresy and Jervis Johnson and Jeremy Vetock rambling on (the latter two something of a guilty pleasure to read – I always complained about their wittering but I also always turned to them first…). 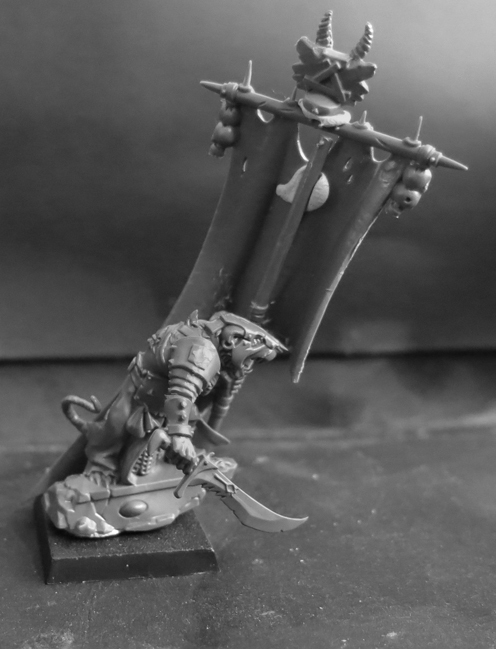 Best of all there was Army of the Month (on that occasion showcasing the kind of Skaven force I’d feverishly dream about if I was able to eat cheese) and the return of Blanchitsu as a regular feature. To my mind those were the glory days and I’d have been quite happy to see something similar continue forever. Alas it was not to be. On the 1st of February 2014 White Dwarf transformed again. Like an amoeba reproducing it tore itself in two. The monthly edition was replaced by a slimmer weekly to reflect the new weekly release schedule, as well as an image heavy showcase piece entitled Warhammer: Visions. To the surprise of no-one at all the internet was chock-a-block with negative reviews, GW-bashing and revisionist history in which a lost golden age was lamented. So vehement was the rage in some quarters that contrariness drove me to want to enjoy the new magazines but it was an uphill struggle. The weekly magazine was hard to get excited about and easy to overlook. With limited space for content there rarely seemed to be enough to warrant making the purchase and even when I did I was generally disappointed. Visions was far better, primarily because it retained Army of the Month and Blanchitsu (both enjoying more space) but the lack of actual text left a lot to be desired and the hefty price tag meant that when my subscription expired so did my interest. For a while it looked like the old dwarf must finally yield to history, swept away by the same digital tide that assails all print media and finally capsized by the disinterest of its captains. 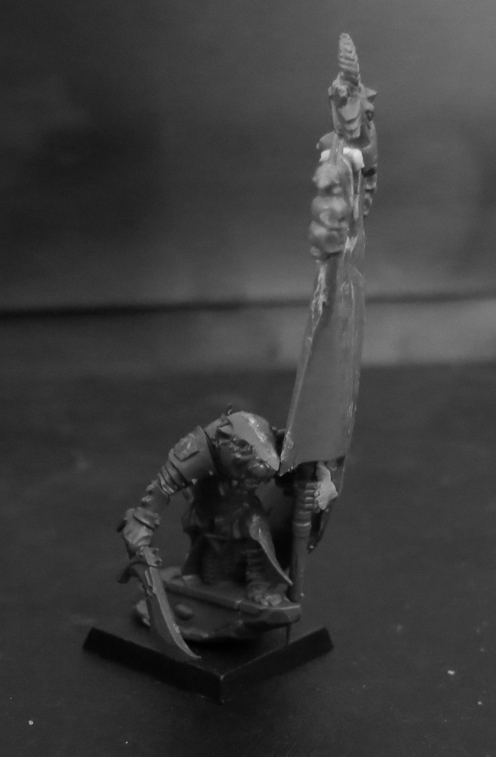 Old hands would lament the magazine of their youth and newcomers, if they looked up from their shiny stormcasts at all, would wonder what the fuss was about. Let’s cast our minds back to that editorial from Issue 3. From being a statement of intent of the most admirable quality it transforms into a prophecy of End Times proportions as the magazine did indeed “drift into a safe, stereotyped format”. Could the editorial staff honestly claim, hand on heart, that it’s pages contained “new ideas and interesting articles” that they “found of interest” – or was it the case that they had in the end become complacent? To the last point at least let’s give them the benefit of the doubt because, whilst I and many others had given up on it, the old dwarf was fighting back. Two Khorne worshipping gents enjoy a theological debate on the cover of the newest issue. The contents of the new White Dwarf, which came through my letter box a couple of days ago, are all over the internet already and much has already been said about this latest iteration of Grombrindal’s august organ (ooh la la!). To my relief all the usual suspects are back; Army of the Month, Blanchitsu, Parade Ground, a Golden Daemon feature, Designer’s Notes, A Tale of Four Persons-Who-Paint-Little-Models, even a terrain feature. Slightly more innovative features include Temporal Distort (a White Dwarf that dares to run the gauntlet of reader nostalgia by comparing itself to an issue from yesteryear! Balls of steel on display there!) and Illuminations, in which GW gives their art department the credit and showcasing they’re so desperately due. Hopefully this latter heralds a resurgent recognition of the value of their artists and no more abominations like the most recent Dark Angel’s codex will be allowed to escape into the wild. 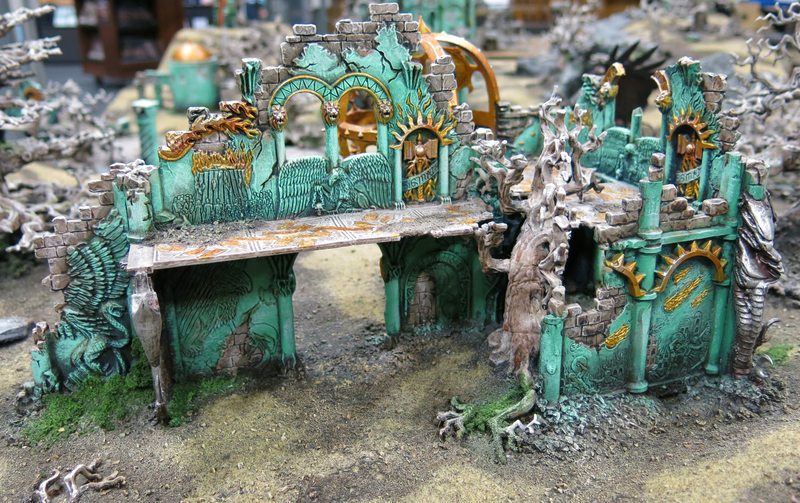 Having seen the Ruins of Dras’shiel showcased in White Dwarf I sought it out for a closer look at Warhammer World. 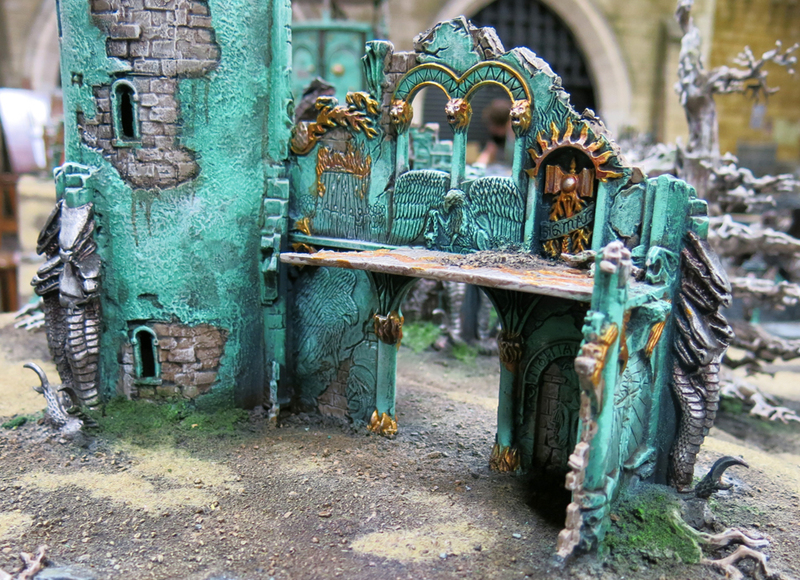 The article explains how the striking jade green buildings were painted, as well as describing how the team experimented and challenged themselves to create something truly outstanding. There’s also a chunky battle-report, something people have been banging on about wanting to see given proper coverage in the new edition since it was first mooted. Now normally I’m not a big fan of battle reports (in fact I tend to think they’re often unbelievably dull) but the one in Issue 351 (my first issue) inspired me with its sheer scale and complexity. For one thing the commanders of the two armies (in other words the leaders of each team) were fighting over an orbital fortress ‘The Destroyer Moon’ in a different part of the building to the other players – communicating with their underlings via written notes and photographs. The objective at the heart of the Destroyer Moon was a huge gun which allowed the controlling player to bomb the world below, whilst their teams fought over three boards representing different regions of the beleaguered planet. Flyers zoomed from table to table and every player had his own secret orders which often contradicted those of their team mates (my particular favourite; one player must protect the colonel of his team mate’s Imperial Guard, whilst his team mate needed to martyr him in a glorious and inspiring manner). Just a snapshot of the action in Issue 351 as four Chapters of Space Marines, two Imperial Guard regiments and a company of Sisters of Battle take on six Ork clans. It seems that someone must have thought to pass this advice on the team at White Dwarf because their latest showdown – although not a patch on that fondly remembered battle described above – is a vast improvement on the rather stale and formulaic “this guy moved then that guy moved, then we rolled some dice, then some paint dried” tedium that we’ve been wading through since. Effort has been put in to make the battle look engaging with lots of arrows to show troops moving and snippets of descriptive text to explain key moments. The text itself also strikes a good balance, not getting bogged down in fiddly explanations but ensuring enough clarification is provided that those who’re not familiar with the rules can follow along anyway. Certainly it managed to keep me engaged with the progress of the game and that’s no easy task. From the battle report in the new issue: a Stardrake takes on the unenviable task of getting me excited about Stormcasts and succeeds. The best thing of all about this newest incarnation are the words – there’s lots and lots of them. 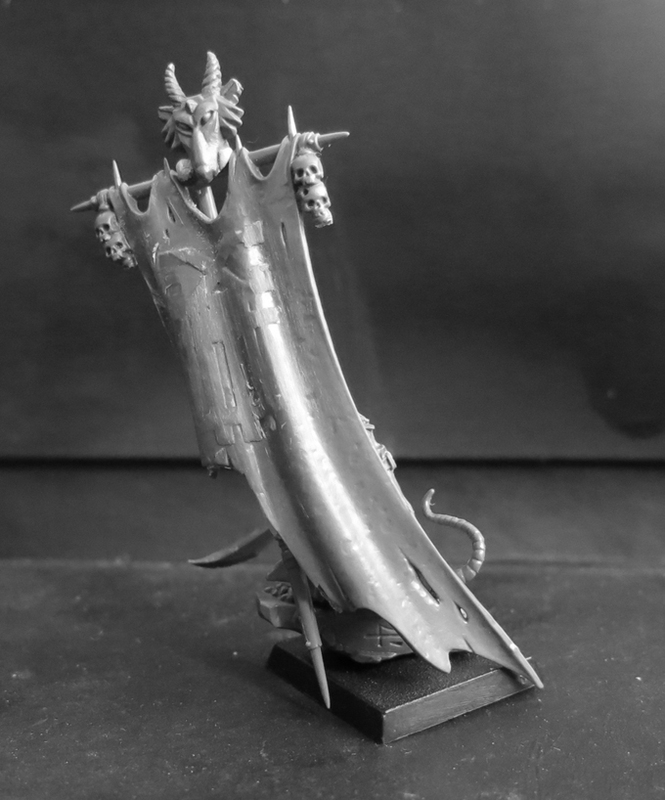 Visions gave us plenty to look at but if you actually wanted something to read, and an insight into the process behind the models, then there hasn’t been much worth bothering with in recent years. It says it all that my copy arrived a couple of days ago and I’ve still only skimmed it – whilst I powered through the weekly issue in half an hour tops. Welcome back old friend – you’ve been missed. All images copyright Games Workshop and used without permission.